Your Bottom Will Thank Me! Lookie at what I bought this weekend. I am pretty sure it’s going to change my life and it just might change yours too. 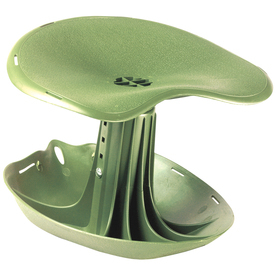 May I introduce to you… The Garden Rocker! I’m not much of a gardener, I usually just plant and get by with what is socially acceptable in my neighborhood and that’s about all. But Oh NO, this bad-boy will not be getting into the garden because he is staying in the garage. I ripped the packaging off and immediately plopped my hiney right into it. And then I started painting. 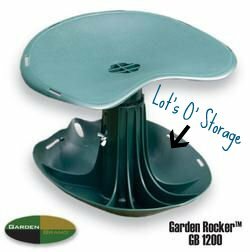 And instead of my crouching at my knees to paint the low areas, I now sat in the comfort and luxury of the Garden Rocker. Your bottom will thank you, and so will your back. and any other thing you might need. Right there at your fingertips! The next time I am at a dinner party I might just toast to “No More Squatting!” because I am really that excited about it. So after all of my ranting and raving you might be wondering where you can purchase one of your own. You have a couple of choices. Lowes has them for $24.99 but found mine at Tuesday Morning for $14.99. I am not sure how much those stores carry in stock, but if you have one close around it might be worth the trip to see. Do you have any painting gadgets or gizmos that you just can’t live without? Leave a comment, with the info on the gadget and I will compile a list of the top 5 (or more) Crafty Must-Haves list. Don’t forget to leave your blog address – I will include your blog address in the list and encourage readers to check out the other blogs that were featured. So tell me: What’s your go-to, crafting or painting gadget or thingymajig that you can’t live without?